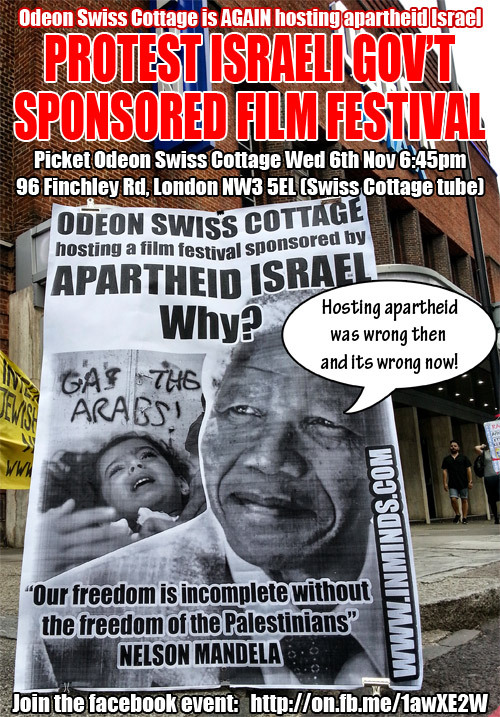 We will be picketing outside Odeon Swiss Cottage on Wed 6th November to protest the cinema's hosting of a film festival sponsored by apartheid Israel. The Israeli Embassy is sponsoring the Jewish Film Festival which is playing at several venues in London including the Odeon Swiss Cottage. 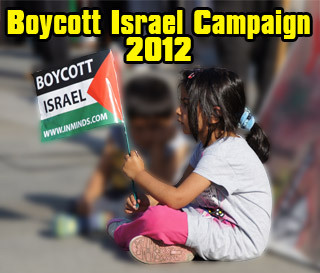 We are protesting the hosting of the film festival, not because it’s Jewish, but because its sponsored by the apartheid state of Israel. In 2003 when Nelson Mandela visited Camden he unveiled a plaque outside 13 Lyme Street, the former home of the eminent anti-apartheid activists Joe Slovo and Ruth First whose home was the hub of the anti-apartheid movement before Ruth First was murdered by the apartheid regime by a parcel bomb, Camden's MP announced "this is a great day for Camden where the British anti-apartheid movement was founded". A few streets away in what in now called Mandela Street was the headquarters of the Anti-Apartheid Movement. As Camden residents, we are proud of our borough’s history in fighting apartheid and racism so we are shocked that our local cinema is collaborating with an apartheid regime by hosting a film festival sponsored by the Israeli Embassy. In the same way as it was ethically unacceptable to host a film festival paid for the South African regime during apartheid South Africa so today its not acceptable to host apartheid Israel. 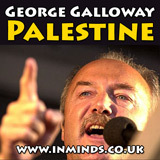 We urge Swiss Cottage Odeon to make a commitment to abide by the Palestinian call for a cultural boycott of Israel. We welcome Jewish filmmaking but we reject the promotion of Israel in the UK while Palestinians continue to live under siege, discrimination and exclusion. We will, inshAllah, be tweeting live (hash tags #SayNoToApartheid #BDS ) from the protest with live photos being uploaded to our twitter and facebook page. So if you can't join us on the day, please help us by sharing the photos as they get uploaded. On 28th June 2018, Inminds successfully stopped the Israeli governments latest attempt to use culture and food to whitewash war crimes against the Palestinian people. On 10th May 2018 Inminds protested the opening gala of the Israeli government sponsored London Seret 2018 Film Festival at the Ham Yard Hotel in Piccadilly. Protest also demanded freedom for recently convicted Palestinian poet Dareen Tatour. Inminds human rights group will protest the London opening gala of the Israeli government sponsored Seret 2018 International Israeli Film & TV Festival on Thursday 10th May 2018 outside the Ham Yard Hotel in Piccadilly. On 8th Sept 2017 Inminds protested the launch event for 'Brand Israel' Tel Aviv in London festival which has been jointly organised by Israel's Strategic Affairs Ministry and Israel's London Embassy to whitewash apartheid Israel under the facade of culture. Join us picket the Israeli Embassy funded film festival being hosted by the British Film Institute and the BAFTA - Israel's latest "Brand Israel" project, whereby culture is used to whitewash war crimes of an apartheid state. During the holy month of Ramadan, as we move towards the Eid, I was going around Muslim shops in Tower Hamlets and elsewhere telling them that although they had collection boxes for the Mosque, although they had religious imagery in their shops, although they were selling dates to the faithful people to break their fast - the dates were made in Israel! They were stained with the blood of the Palestinian people! And Muslim shop keepers were selling them!